5 Healthy Easy Smoothie Recipes for Summer! Beat the bloat! 5 Healthy Easy Smoothie Recipes for Summer! If you guys follow us on Snapchat, Instagram or Facebook you know we are like mega smoothie fans. Not just any smoothies. We are all about the healthy easy smoothie recipes! And yes, we’re all-year-round smoothie girls BUT in summer we reckon it’s essential to add smoothies to your life (maybe even to every day!). Are smoothies a food group? We think so. 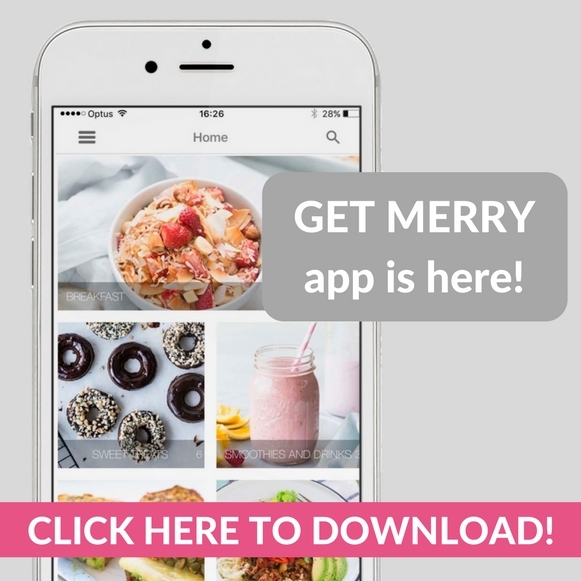 We’re extra excited about these recipes as they are Get Merry App launch recipes! So they are exclusive to our brand new healthy recipe app! You can download it here! It’s just $2.99 (AUD) during launch week, after launch week it goes up. So don’t miss out! they are freaking totally drool worthy yum. We have many many (MANY) smoothies and every single time it’s like “OMGosh this is the best smoothie ever, it’s so freaking yum”. you can kinda multi-task. Ok, so we know we’re all meant to be mindful when we eat/drink/do everything BUT c’mon some days it’s impossible and you’re on the laptop while eating/drinking breakfast or lunch or dinner. This is where smoothies come in extra handy. You can enjoy them one handed. This means you won’t be shoveling down your food! You can still drink it at a slow pace (or your regular pace hehe). 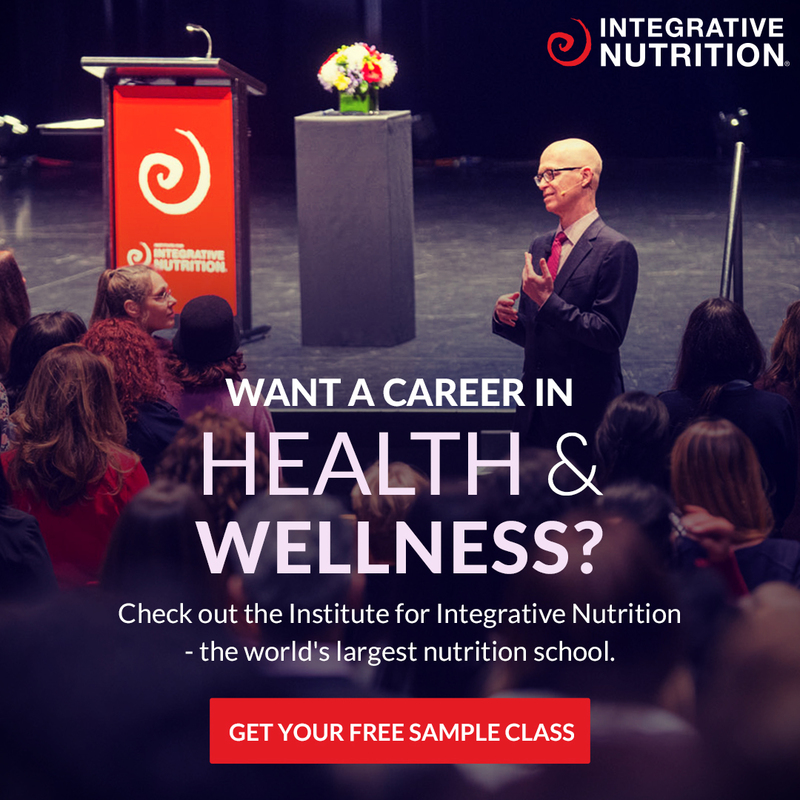 you can get extra good stuff into you. We’re talking gelatin, turmeric, greens powder, chia seeds. Simply add a spoon full and whiz! This one is first because it is the best. Like OH HECK YEH the best. Ahhh. We want to drink this everyday all day (not a good idea, do not do that). It might sound like a weird combo but it is freaking amazing! It’s so fresh and feels like some serious detox action is going on. Add your fave greens powder for an extra boost! Really, we want to add chocolate to every single smoothie but we know that a. not everybody loves chocolate and b. it’s good to mix up food! BUT this one has got raw chocolate and it’s serious heaven in mouth. It’s filled with delish papaya, pineapple and orange flavours. Close your eyes while you sip and pretend you’re on some kind of island paradise. Who-da funk that spinach, berries and delish natural protein would make the most epic smoothie. Well it does. We can confirm! Alright! We’ve got easy healthy smoothie recipes for days now… ok, well 5 days! But anyway. Smoothies rock! 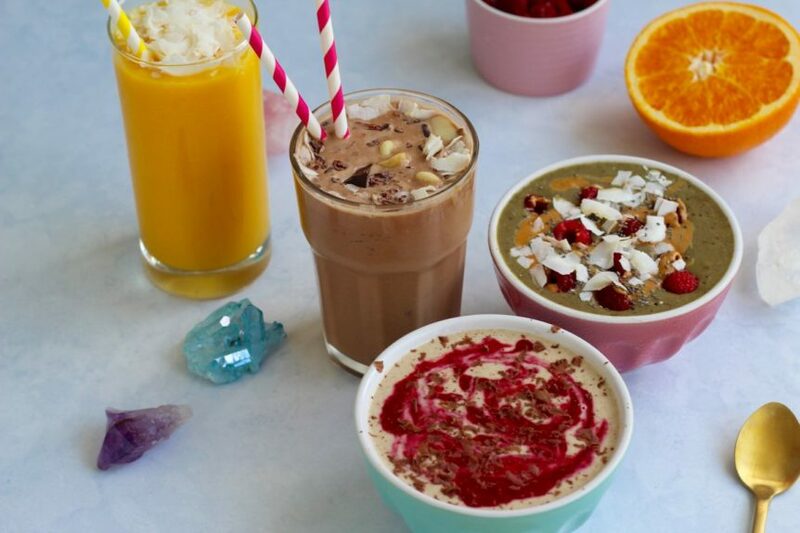 You can get ALL these smoothie recipes in the Get Merry App PLUS over 100 other healthy, easy, fun and YUM recipes from the blog! It’s only $2.99 (AUD) for this week only!